Less than two weeks left of school, which means some hot summer days are upon us! What are you planning to do this summer? We are usually very spontaneous with our vacations or trips. If we plan, we usually plan a week in advance. To give you an idea how spontaneous we are here is a quick story how we met. My husband saw me on a picture; he lived in Canada, and I was here in the States. As soon as he saw the picture, he found out my number and gave me a call immediately. We met six days later; he proposed about four hours after we saw each other for the first time, and we got married two months later. This year we will be celebrating our ten-year anniversary. Crazy! I know, I guess when you know, you just know, and there is no point to date, especially long distance. So what about these delicious summer melons? Full of goodness, of course! They keep you hydrated, packed with vitamin C and A. Melons are the perfect low calorie food that provide so many vitamins and nutrients. 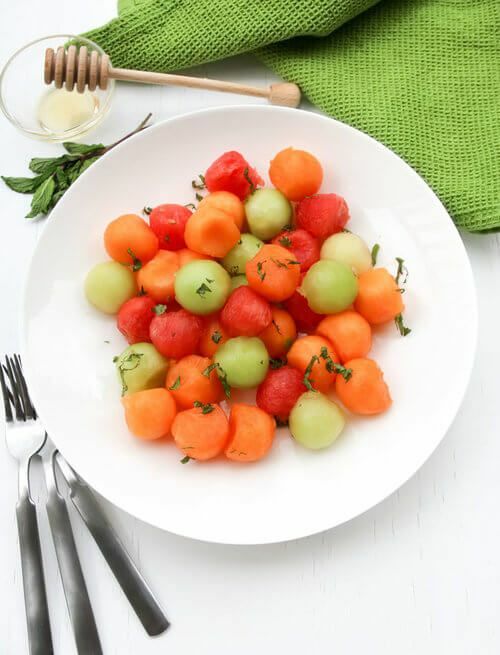 So making this delicious summer sweet melon salad will only benefit you! Cut 1/2 cantaloupe, 1/2 watermelon, and 1/2 honeydew into bite size pieces. Chop 2 stems fresh mint and sprinkle on top. Whisk together 1 Tablespoon honey, 1 Tablespoon water, and 1 Tablespoon lemon juice together. Combine with cut fruit.